For commercial and non-commercial endings. The included resource textures were made by myself in Photoshop. lovebugg (7 years ago) Inappropriate? Thank you very much, I am new at poser and have no idea what I am doing, but I am giving this a shot. PhantomMoon (8 years ago) Inappropriate? Thank you very very much for this, I am so glad you posted such a beauty! My previous comment got cut off. I was saying this is a nice texture without fake highlights that desaturates well.Which also makes it good for good for creating replacement hair bump maps because certain older hairs even have the fake highlights in the bump maps. My previous comment got cut off. I was saying this is a nice texture without fake highlights that desaturates well. @Maki82, If you desaturate the hair texture to greyscale, you can use the same basic technique in DAZ Studio and Poser - use the greyscale image for texture, and change the diffuse colour to whatever colour you want. This set seems to do the desaturation on the fly in the Material Room, but the technique is the same. 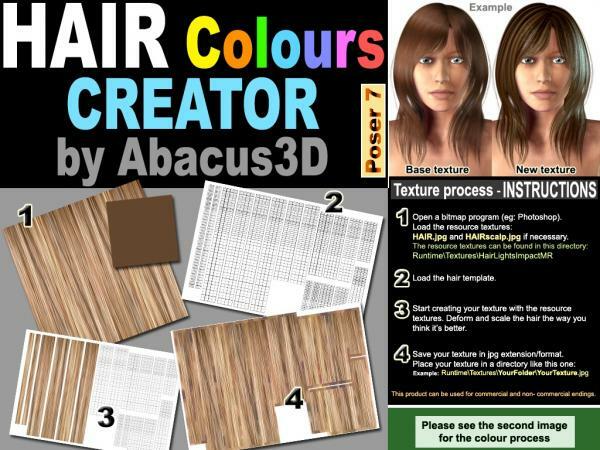 Ooo, perfect for some freebie hair meshes I have planned! Thanks ever so much! dyald (10 years ago) Inappropriate? Thanks! This will really come in handy! Like darklady7 said, with instructions, it is cool!!! Thank you! With instruction, it is cool. Thank you. ~Wolfie~ (10 years ago) Inappropriate? WOW! Thank you so much for sending this link to me! I really appreciate it!